Grace and Tippi are twins – conjoined twins. And their lives are about to change. But what neither Grace or Tippi realises is that a heart-wrenching decision lies ahead. A decision that could tear them apart. One that will change their lives even more than they ever imagined… From Carnegie Medal shortlisted author Sarah Crossan, this moving and beautifully crafted novel about identity, sisterhood and love ultimately asks one question: what does it mean to want and have a soulmate? What I love about Sarah Crossan's novels is that she always has a simplistic, easy to follow plot- but the writing style always very unique, it instantly draws me in from the first page: hanging onto her every word. Each of her books are very different, appealing to all different personality types of her readers. 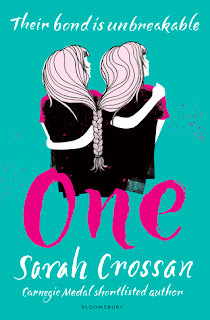 'One,' is a book that everyone should put on their summer read list, as I thoroughly enjoyed reading it on my hammock in my garden, on the few hazy summer evenings we have had. I managed to laugh and cry simultaneously while reading it, so Crossan has a very special talent, to be able to bring that out in her readers. Tippi and Grace are conjoined twins, and their parents have kept them sheltered from the judgemental glares and snide remarks- until they both have to go to school, as home schooling is not an option, due to costs. They both will have to face a whole new crowd of people, desperate to know every single inch of their lives. But both the twins have little idea how little of a worry the new school is, compared to a life changing decision heading their way. Honestly, I just said to myself at the time when I started this book, that I would read only a few chapters. Before I knew it, I was approaching the end of the book- which is pretty amazing, considering all of the exams I have just had! Sarah Crossan has shaped each of her characters perfectly, as the main family unit in the novel could easily fit comfortably as a loose template for other families- making the book become quickly more relatable. The unbreakable bond between both of the twins had me in tears, as their story is very special- it made me very aware and largely empathetic to any sets of twins who have had this before. There are definite characters that you can see yourself in, but they are all so different that any of them could be your favourite. 'One,' is so phenomenal, that I recommend that it is put at the top of your TBR list straight away, as it is an honour and a pleasure to read. I am really excited for this book to come out. It sounds very interesting and unique! Great review. I am glad you enjoyed the book.